The CEV for BC data suggests that, as in the rest of Canada, the Chevy Volt maintained a dominant market share in British Columbia. Their numbers suggest the Volt is half the market. 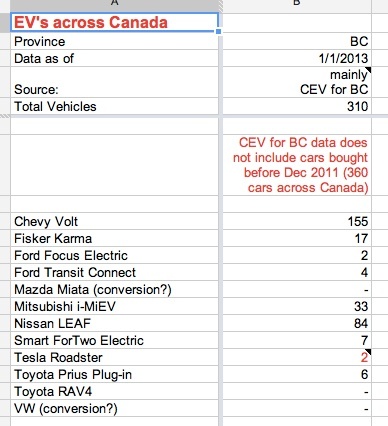 While CEV data does not include vehicles bought prior to Dec 2011 — and two-thirds of the EV’s bought in Canada before then were Chevy Volts — their dataset doesn’t include any Teslas. The Volt’s 50% market share in BC is much lower than its Canadian market share in 2012 (70%). We can do the math to conclude that excluding British Columbia, the Volt had about 75% EV market share across Canada in the (Dec 1 2011 – Dec 31 2012). After the Volt, the next-best selling plug-in vehicle in BC has been the Nissan LEAF, representing about 1/4 of the market, with the other automakers splitting the balance of consumer interest. The BC portion of the spreadsheet is reproduced below. does this data take into consideration the custom EV market. I am sure you know that doing a conversion on a fossil fuel powered vehicle is a great deal less expensive. The numbers don’t take custom conversions into consideration — they’re built off manufacturers’ monthly sales announcements, and so conversions fall under the radar. I’d guess there are few enough conversions (a handful across Canada per year, now that OEM EV’s are available?) that they become rounding error to the current sales numbers. It’s just that DIY markets tend to be a lot smaller than OEM markets. Now that you mention it, though, perhaps I’ll try to contact HyMotion and other companies who’ve been doing conversions, to try to get some actual numbers! Perhaps the biggest gap in the spreadsheet is that it doesn’t factor in electric scooters, which are cheaper (and probably much more numerous) than EV automobiles. Unfortunately, data on their sales seems harder to come by.